THIS PROJECT HAD BEEN COMMISSIONED BY CITY OF SYDNEY AS PART OF AN ANNUAL ART PROGRAM. TEAM CONSISTS OF AN ARTIST, ARCHITECT AND CURATOR. RAP PAR―a team from Istanbul, Turkey―proposes a sound and light installation, namely Augmenting Spatiality for Abercrombie Lane. The installation’s premise is to reveal specific ambient qualities of Sydney and Istanbul as distinct urban ecologies, but also like a cultural exchange, put their sampled qualities into a dialogue that responds to one another. The dialogue will be framed on a spatial narrative referring to ‘equal’ volumes of spaces to create sequence, compression, gateway, perception and extension in the formal geometry of the space. Abercrombie Lane was specifically selected as it is the only site that is common to many of the urban spaces in Istanbul, but also as it does not receive direct sun to the ground which creates a very suitable environment for light installation. 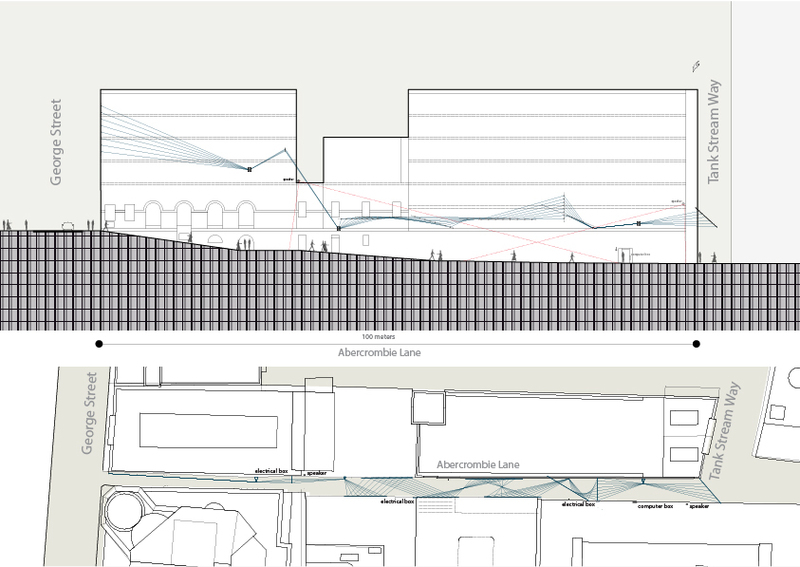 RAP PAR is taking Beyoğlu-Karaköy axis as its main spatial center to collect sound, and specifically İstiklal Street as the ‘main spine’ (with particular resemblances with the George Street, including current urban transformation urgencies) to form the background sound vocabulary of ‘equal’ volumes that are connected to this main axis.